The Nisqually Tribe is changing how it spawns hatchery chinook in an effort to give orcas a more nutritious meal. 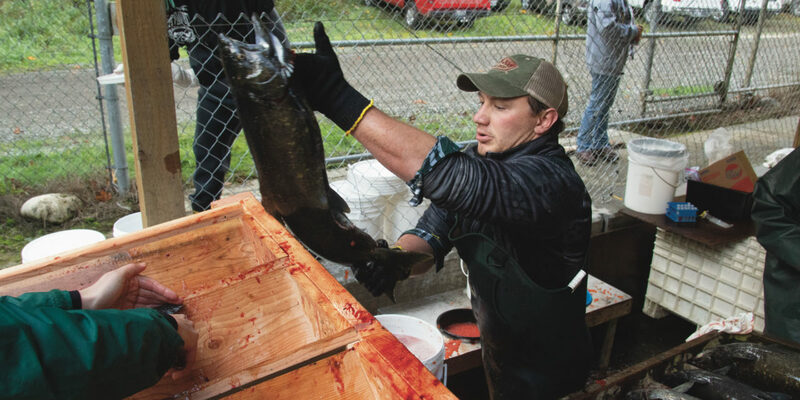 “Puget Sound hatchery chinook have been getting smaller and smaller for decades,” said David Troutt, natural resources director for the Nisqually Tribe. The number of southern resident orcas has declined from nearly 100 to 74 in the last 20 years in part because they aren’t getting enough chinook, their preferred food. The orcas and chinook are both listed as threatened under the federal Endangered Species Act. Instead of mixing eggs and sperm from chinook of various sizes, staff at one of the tribe’s hatcheries spawned only large chinook with other large chinook. This year, tribal staff spawned all of the chinook at Kalama Creek, creating a large chinook and small chinook group. In future years, they plan to spawn only the larger returning chinook. “Over time, we hope to see larger chinook coming from those larger parents,” Troutt said. No one knows why chinook salmon have been coming back smaller. But the key might be in how salmon choose partners in the wild. The tribe will implant a coded-wire tag in each large chinook, so when they come back, they will be identified as descendants from the group. Tribal staff also are taking genetic samples so they can track the project over multiple generations. “This will be a long-term experiment to see if we can reverse this trend of smaller chinook,” Troutt said. The real solution for both chinook and orcas is more and better habitat for salmon. The Nisqually Tribe has been working with their neighbors for decades to restore salmon habitat in the Nisqually River watershed. But salmon habitat in Puget Sound continues to decline.